New World Library, 9781608683697, 288pp. Meditation is a form of mental exercise with numerous scientifically verified physical and psychological benefits. As meditation teacher Rick Heller shows, the benefits of the practice extend beyond the personal to enrich relationships with others, with one's community, and with the world. In Secular Meditation, step-by-step instructions, personal stories, and provocative questions teach empathy for others, stress reduction, and the kind of in-the-moment living that fosters appreciation for life and resilience in the face of adversity. Heller simplifies what is often found mysterious, describing and providing detailed instructions for thirty-two different practices, ensuring that anyone can find the right one. 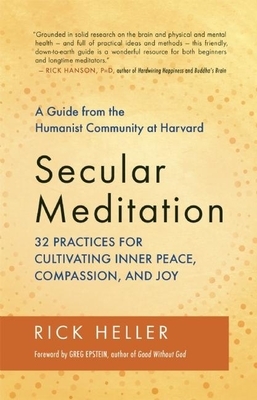 Meditation teacher Rick Heller leads the Humanist Mindfulness Group at the Humanist Community at Harvard. A freelance journalist, he has written for The Washington Post, The Boston Globe, Buddhadharma, Free Inquiry, Tikkun, and Wise Brain Bulletin.